In the aftermath of the devastating Manchester arena terror attack, many musicians have paid their respects to the victims. The attack last Monday, at around 10:35pm, claimed the lives of 22 Ariana Grande concert-goers, many of whom were just teenagers. The youngest victim, Saffie Roussous was just eight-years-old. 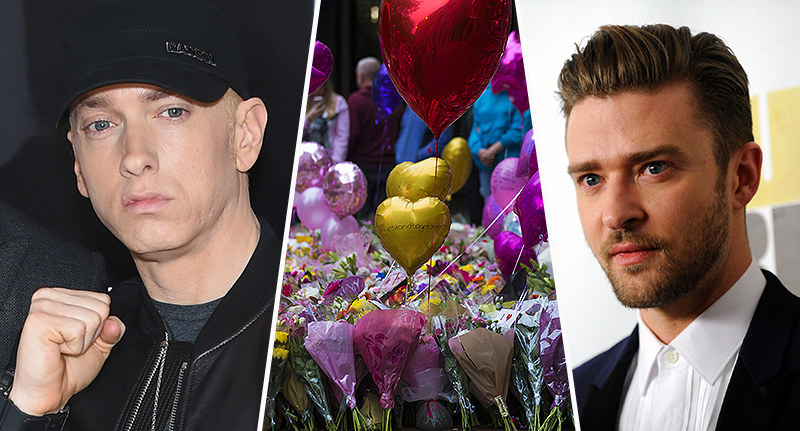 Reacting to the atrocity, Justin Timberlake and Eminem have helped raise almost £2 million to be donated to the bereaved families. Eminem, who is notoriously quiet on social media, was so deeply affected by the loss he tweeted his fans and encouraged them to donate to the JustGiving efforts. The funds raised, in collaboration with the Manchester Evening News and the British Red Cross, have now totalled over £1.8 million, at the time of writing. The generosity of the public means the charitable efforts have almost reached the target of £2 million. Justin Timberlake quickly followed suit, as the latest in a long list of performers who have showed their solidarity with Ariana Grande, who was ‘broken’ by the attack, including Take That, Liam Gallagher and The Courteeners. The 23-year-old pop star has reportedly offered to pay for the funerals of the 22 victims who lost their lives at the hands of a cowardly suicide bomber.